I agree but I wouldn’t want Osgood. Are You Joe27157Productions on YouTube By Any Chance? 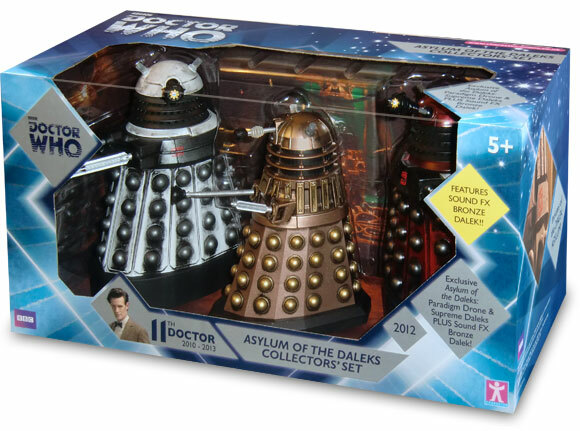 If they were doing a asylum set, I would have liked at least one classic dalek included, but I love the bronze one! If there was a supreme in the asylum, does that mean the one with the pm is not the one from series 5? How can the purest of daleks go mad? Because Daleks view madness and anger as being pure. The Asylum was designed to keep these “beautiful” Daleks locked up to be admired. Actually, the Asylum was more to lock up the Daleks that went “wrong”, the ones that were too insane to be controlled. 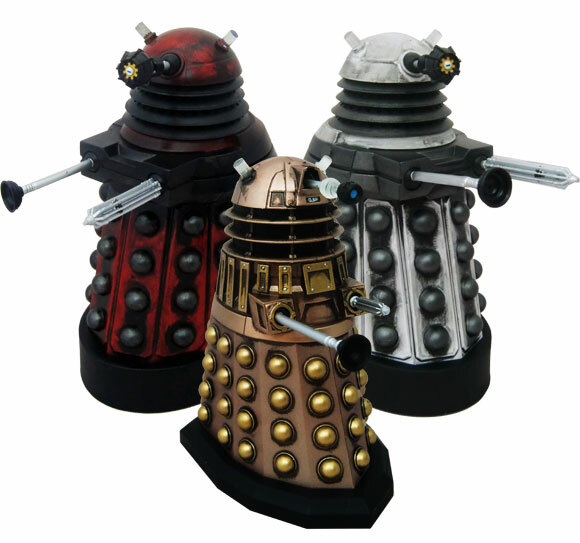 Love it, I just wish we could have a metallic red clean Dalek! Owning the clean metallic blue one, I would have loved a clean one to go by it’s side. Oh well, we can hope. Either way, the dirty version is still fantastic, as are the other two, I just hope we get to see a classic version of the set, say, an Asylum “Dead Planet”, “Genesis” and “Evil” Guard Dalek set? 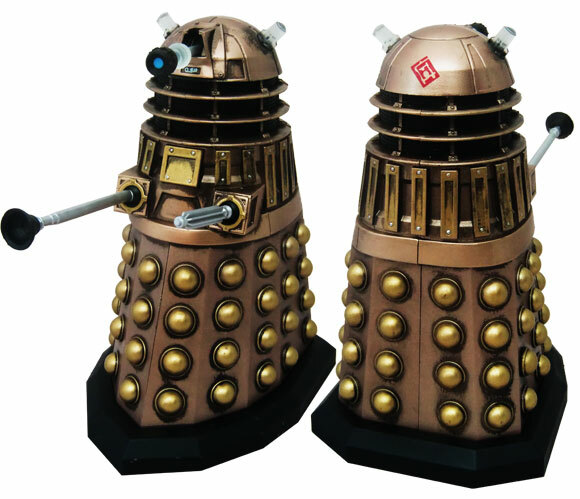 For all the people complaining about no classic daleks, it has been confirmed there is a separate classic dalek set as well! A second one of theses sets would be great, with a mk1 and mk 3 Dalek with the dalek prime minister. Inaccuracies aside, these look nice! I definitely want to get this, even though I already have a Series 5 Supreme Dalek! Would have liked a plain metallic red Dalek but still quite cool! Hmm… May get this, or may not. I’d rather concentrate on figures which can be used in multiple stories… I can’t have all of my Dalek figure adventures featuring battered Daleks, just like I can’t have all of my Peter Capaldi figure adventures with him wearing Matt Smith’s clothes (hint, hint, UT) and it would be a shame just to have them sitting on the shelf. Totally agree with you there, I’m the same! Booboo do you know if this will be the TRU or B&M asylum set? Look at the shiny shiny!!! Great idea for a set, cheap to produce to offset the cost of completely new stuff! The only thing I would’ve done different is I would have swapped the Supreme for a classic Dalek. More screen accurate (I think) and each era of the Daleks would’ve been represented. inaccuracy aside, they still look …FANTASTIC! No classics? Still brilliant, these will come in handy for people who do figure adventures. Booboo when are these expected to come out? Insanely excited about it! It’s such a shame that there’s no classic Dalek figure within this set. Kind of mirrors the actual episode. Looking foward to this! 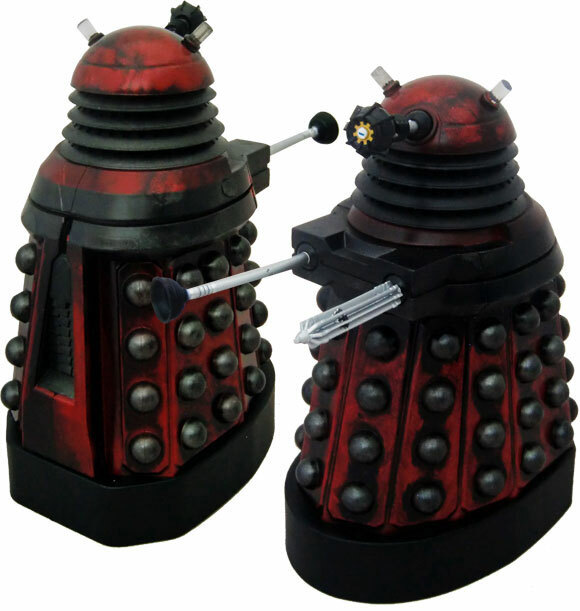 I especially like the new Paradigm Daleks, although it would’ve been nice to have new ones instead of weathered. However, it’s really great to have some proper ‘asylum daleks’ 😀 What price might it be? Presumabley around the £25 mark? Don’t you dare call them teletubbies ever again! 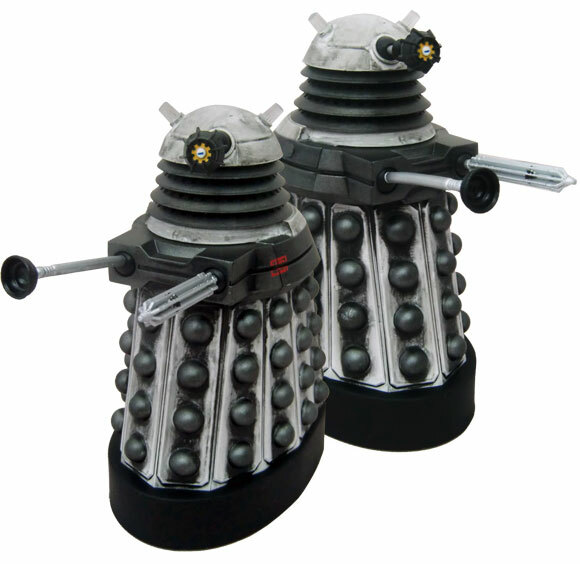 Although I do love the design of the Paradigm Daleks, I have grown fond of the term “Dalek Rangers”. These look excellent great day for 5 inch collectors!